After months of construction and $12.5 million in expenditures, Kuhio Beach, Waikiki's main stretch of sand, has a new sidewalk promenade with landscaping and fountains. An additional $3 million will be spent to complete the landscaping and sidewalk as far as the Natatorium, the national and state historic landmark built in 1927 to honor islanders who died in World War I, which will undergo its own $11.5 million restoration. Also along the beach, Kapiolani Park has gone through an upgrade, with more than $10 million spent on improvements to the Honolulu Zoo and a new bandstand used for special events and the Sunday afternoon Royal Hawaiian Band concerts. Additional plans call for the creation of an Iwi Kapuna Memorial in front of the zoo to re-inter the bones of ancient Hawaiians who were buried in Waikiki and other areas of Oahu. At the other end of Waikiki, Fort DeRussy, the neighborhood's only open space besides Kapiolani Park, is being upgraded and beautified as part of a $135 million project. Throughout Waikiki, the streets and sidewalks are being transformed with new traffic signals and antique-style lampposts hung with baskets of flowers. The new Waikiki Historic Trail's 21 markers point out historic sites and tell the story of old Waikiki, from the time it was the playground of royalty through its development to one of the world's most famous beach resorts. 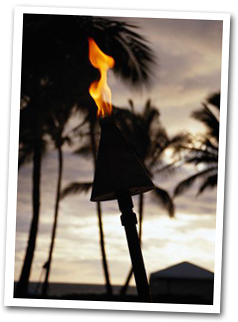 One of Waikiki's new and signature attractions is the tradition of torch-lighting ceremonies that occurs most evenings throughout Waikiki. Less ceremony than ritual, what you'll see is a half-clothed, brown-skinned man running down the street, or on your hotel grounds, with a stick of fire in his hand. His job is to light the torches. You can witness that scene at about 6:30 each evening when the torches are lit at the Royal Hawaiian Shopping Center. At the Ilikai Hotel, a conch shell blower adds an ancient echo to the scene. At Kuhio Beach Park, the nightly hula pageant begins with a torch-lighting ceremony and the call of a conch shell. The free show runs from 6:30 to 7:30 each evening. The city has just completed renovating the Kuhio Beach hula mound for this highly popular show. The renovations provided improved pedestrian access to the mound, with construction of two concrete paths, one along the base of the stage and one to the rear of the viewing area. Provision also made possible a wear-resistant surface on the hula mound stage itself. Artificial turf replaced the natural turf that was impossible to maintain because of the constant use. A concrete pad was also installed at the rear of the stage area. Enjoy a beautiful Hawaiian sunset, romantic torch lighting and conch shell ceremony, and authentic Hawaiian music and hula performances right on Waikiki Beach. The hour-long show starts just before sunset and features the young men of the "Men of Ho'a" in a torch lighting ceremony, followed by the award-winning hula halau schools dedicated to hula and Hawaiian culture from throughout Oahu. 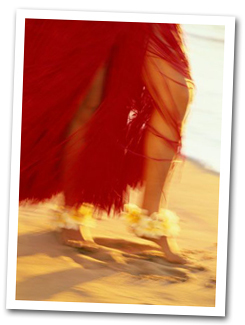 Authentic Hawaiian music and hula shows by Hawaiiês finest hula halau (dance troupes) and Hawaiian performers. Opens with torch lighting ceremony and blowing of conch shell. Nightly except Mondays, weather-permitting. 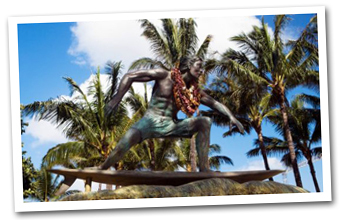 6:30-7:30 PM (6:00-7:00 PM in Nov, Dec, Jan) at the Kuhio Beach Hula Mound, near Duke Kahanamoku statue, beachside at Uluniu & Kalakaua Ave. in Waikiki. Outdoors, casual. Seating on the grass; beach chairs, mats, etc. okay. Cameras are welcome. 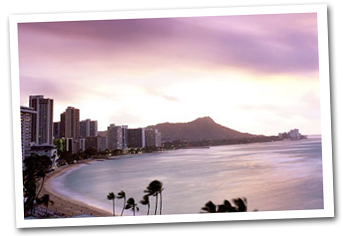 Presented by the City & County of Honolulu, the Hawaii Tourism Authority, and the Waikiki Improvement Association. For information, call 843-8002. Royal Hawaiian Center, formerly Royal Hawaiian Shopping Center, is the premier shopping, dining and entertainment destination in Waikiki. The 4-level Center spans a 3-block stretch of the famed Kalakaua Avenue and is currently being revitalized and expanded to more than 310,000 square feet of world-class shops, restaurants and entertainment. Owned by Kamehameha Schools and developed and managed by The Festival Companies, the Center will soon feature 110 shops, 10 anchor restaurants, a world-class state-of-the-art live performance showroom and the largest open garden space in the heart of Waikiki. It remains open during its revitalization. Royal Hawaiian Center returns to the traditions of Helumoa in Waikiki through Hawaiian story telling, dance and music in The Royal Grove. As one of the largest lush green spaces in Waikiki, The Royal Grove is a centerpiece for entertainment and cultural gatherings with local hula ha-lau and other exciting performance groups. For a hands-on experience, guests also enjoy free cultural classes including 'ukulele, hula, lei making and Hawaiian quilting are offered at the Center. Waikiki Beach Walk is the largest development project ever to be undertaken in Waikiki's history. 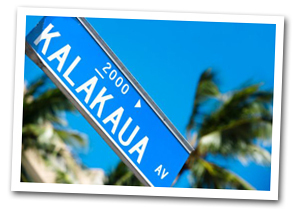 The 7.9 acre area, bordered by Kalakaua Avenue, Lewers Street, Kalia Road, Beach Walk and Saratoga Road, has been completely rebuilt and has emerged as a vibrant showcase and gathering place in the new Waikiki. With a total construction cost of $535 million, it features an outdoor entertainment plaza, 41 new retailers, six great restaurants, and five hotels. Incorporating a design theme that celebrates Hawaii's voyaging and ocean heritage and takes advantage of the island's cooling trade winds and year-round excellent weather, Waikiki Beach Walk is the consummate expression of Hawaii today -- a place where people come to be enlivened with warm hospitality, a rich confluence of cultures, and nature's precious gifts from land and sea. Waikiki Beach Walk has become an icon for Waikiki's revitalization and a symbol for the area's successful renaissance," said Barbara Campbell, vice president of retail development for Outrigger Enterprises Group. " we are reminded of what was once narrow streets and aging buildings and is now a bustling shopping and dining destination for thousands of visitors and residents."